Here at Quad Fuels Ltd, we cannot stress enough the importance of routinely checking your fuel tanks. These checks will include both a visual inspection of your tank to ensure there are no cracks, leaks or any signs of stress, as well as to check the current level of your fuel. Leaving your fuel to run critically low is not recommended and can become detrimental to you in a variety of ways, whether you are on a commercial or agricultural site. Running out of fuel during the cold winter months can be incredibly troublesome; leaving your family in the cold and risking a decline in workflow for many types of business in varying industries. It is highly recommended that you are ordering a replenishment of fuel to your tanks with at least a couple of weeks to spare when using fuel for domestic purposes, or when your fuel level reaches no lower than 20%, to guarantee that you are not caught short and run out of fuel. Quad Fuels Ltd provides a high quality, customer focused fuel delivery service. We will do everything and anything we can to ensure that you are supplied with enough fuel for what you need it for. Just be sure to order your fuel with plenty of time to spare. There is nothing worse than being caught short in a time of need or emergency, and we are but a phone call away to prevent this from happening. 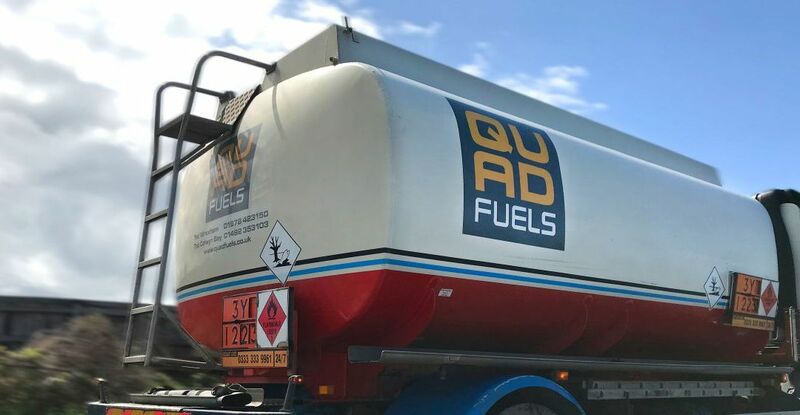 Do not hesitate to contact us to today to discuss your fuel requirements, and exactly how Quad Fuels Ltd can save your money in the long term, how we can provide you with efficiency with your fuel consumption and improve the overall performance of your fuel with specially designed additives. The Quad Fuels team are always more than happy to help new and existing customers.